When it comes to inventions, the imagination plays a huge role in design and function. The extension plug is no exception. Although the current design is pretty functional, a reinvention of this common household item may prove to be even more so. Youngkwang Cho, a designer from California, using a bit of imagination has come up with the Curious Extension Plug. 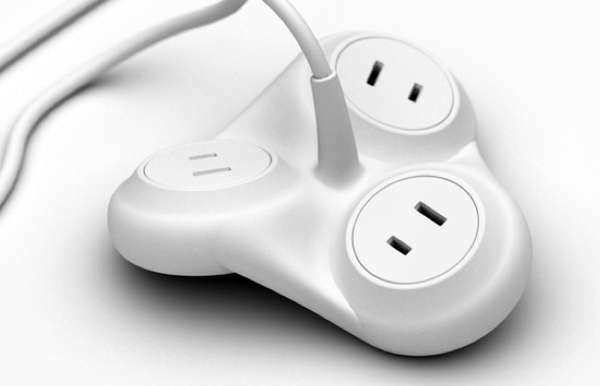 Aptly named, the Curious Extension Plug is not shaped like your typical rectangular extension cord. This one has three sockets surrounded by a cord that plugs into the wall. This plug, much like the Curious mobile phone lies flat when it is not being used. This was also an invention of Youngkwang Cho. When the extension plug is being used, it twists and turns, changing shape as if it has come to life. The extension plug, like the Curious phone comes to life when it is being used. When a call comes through the phone it rings and vibrates like a standard phone, but it also changes shape. It becomes more conducive for holding against your ear and returns to the flat shape when it is deactivated. This just requires pushing it against some type of surface, such as a table. Youngkwang Cho’s inventions also include a snow lamp that was inspired by the ridges made by snow when the wind blows. As previously stated, the imagination is a great inspiration for inventions or reinvention of commonly used objects. The extension plug may provide another benefit by twisting and turning and seeming to warp as if it is melting. The impression that is given is that caution should be used when touching it, even though it is not hot. The sockets all go in different directions when the plug is in use which can be beneficial for short cords. Although most people try to hide their unsightly extensions behind furniture, they may prefer to show off this unusual plug. The Curious Extension Plug has been described as “aesthetically unique and pleasing”. This is not the typical description for an extension but they have never been viewed as fun products. They were more for function than appearing pleasing to the eyes.